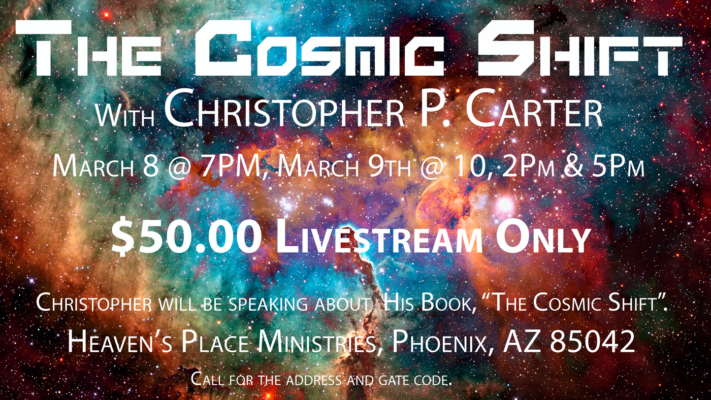 Join us as we host Christopher P. Carter sharing with us about “The Cosmic Shift”. Christopher Paul Carter was born in Houston, Texas and spent most of his formative years in the Carolinas and Pennsylvania. Having a passion for science, he went to college in Charleston, South Carolina to study physics. It was during his time at the College of Charleston that he had an arresting encounter with God that changed the course of his life. After years of searching, the Lord started taking Christopher to the heavenly places in the Spirit, and it turned out to be the greatest blessing of his life. He believed that if it happened to him, it could happen to anybody, so now he teaches and trains people to realize their access to the heavenly realms. Christopher’s journeys in the Spirit have also provided some insight into the purpose of the stars, time, and the cosmic ages. Since we are living in a cosmic transition right now, he believes we have been given an invitation to take part in this next great shift.